Location of general hospital 44 in Europe WWII? I haven't been able to find a reference to GH 44. It would have been near Aachen, Germany, in October of 1944. Re: Location of general hospital 44 in Europe WWII? During WWII, General Hospital No. 44 was assigned to Townsville, Australia in 1944 and moved to Leyte in the Philippines in 1945. The hospital was not assigned to the Europe Theater. GH 44 on discharge papers would indicate "General Hospital 44", I believe. And I have seen it listed as "France". And know that my father was hospitalized somewhere near the French/German/Belgian border. I'm wondering what I'm missing here? Could there be 2 GH 44s? Thanks. Hi Jean, yes that is different. My dad had a similar story, hospitalized for 3 months in England after being injured on D-Day and then returned to his unit. I'm not 100% certain, but I think that might not be General Hospital 44. It might be 121st General Hospital, with Purple Heart was awarded under General Order #17 in 1944? I know for my dad, he received his Purple Heart while in hospital (he saved the paperwork so I have the actual General Order). His separation papers read similarly (GO 6 HQ 83 GH 44); and he was in the 83d General Hospital, with his PH award under General Order 6, given in 1944. I can't see from your photo, but what is under Item 6 (organization) on his separation papers? If you don't already know it might give his unit; although often servicemen were transferred to a different unit just before separation; or sometimes even a replacement depot. Very helpful. Makes sense. Thank you, Joan! Thank you for posting your follow-up requests on History Hub! Ms. Stachnik is correct. Your father’s Purple Heart was issued under General Order No. 17 (1944) by the Headquarters, 121st General Hospital. The hospital was located in England. Unfortunately, the general orders for 121st General Hospital are incomplete and do not include GO#17 for 1944. 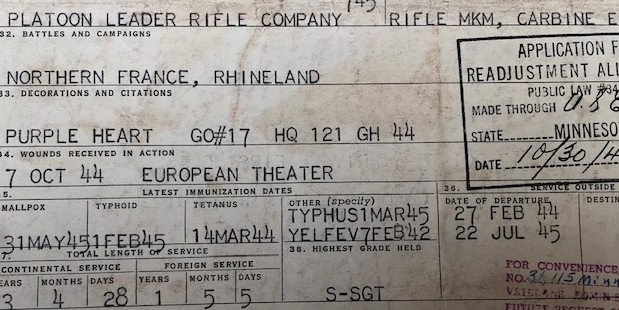 If you could scan the entire DD-214 for us, we may be able to assist you in locating his unit’s records. Yes, Joan’s information makes complete sense. And General Hospital 121 was near Yeovil, England, and I know that to be where my father spent time. She is also correct in suggesting that he was likely assigned to another unit prior to his discharge. In fact it was to a unit of the Army Air Corps. And I believe he was with a Relacement Unit when he was shipped out from NYC in early 1944. So I may not be able to find out what infantry unit his was with in Normandy and the Ardennes. Glad the information was of use to you. You might want to consider posting your dad's entire separation papers, as Ms. Collier suggested. There might be more information available the Archives can help you with. Sorry but I don’t seem able to issue the entirety of the discharge paper in this space. Are you able to access this link? His DD-214 indicates that the last unit he was assigned to was the Headquarters & Headquarters Squadron, 86th Air Depot Group. The National Archives at College Park - Textual Reference (RDT2) has custody of microfilm copies of operational records relating to U.S. Army Air Force units. We searched the index to Air Force History microfilm and located histories of the 86th Air Depot Group on Reel B0714, Frames 513- 722. Records of lower echelon units, such as squadrons, sometimes were incorporated into the files of the group. For access to and/or copies of this microfilm reel, please contact RDT2 via email at archives2reference@nara.gov. I did know of this Army Air Depot assignment just months prior to his discharge. But is there any way to find out what unit he was with in the Ardennes and Normandy? Im guessing it was the 9th Army Infantry in the Hurtgen. I believe his assignment to the Army Air Corps came after his release from the hospital in England in early 1945.